The CR-03 Coercimeter measures the coercivity for soft magnetic materials. The CR-03 Coercimeter is a DC automatic measuring system to characterize samples having irregular shapes — in a fast and easy way. 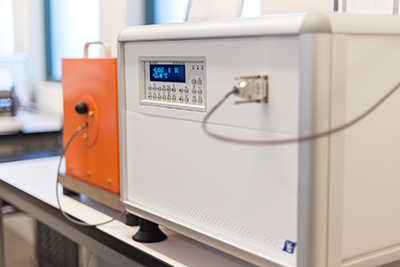 The CR-03 Coercimeter detects the stray field emitted from a magnetized sample with a Hall probe in close proximity. By applying an increasing demagnetizing field with the solenoid coil, the stray field is reduced to zero. The result, the demagnetizing field coincides with the coercivity of the material. The coercimeter measurement is automatic and easy to use with the custom LE software that comes standard. Soft materials measured include: iron and carbon steels, soft ferrites, amorphous alloys, nano-crystalline alloys. LE’s proprietary coercivity software automatically controls the measurement process. It takes less than 30 seconds to get accurate measurements, display the coercivity, perform a quality control routine, and store data for statistical elaboration. Other available options include: integrated database, customizable print options, and data management. Support is guaranteed via TeamViewer, Skype and through our software that allows sending, manually or scheduled technical assistance request via email. LE’s real-time virtual assistant is on call to provide suggestions and warnings during the measurement cycle and help keep the machine updated. Training is provided during the acceptance test at Laboratorio Elettrofisico before delivery. At your facility upon request.